Dates: Friday, February 1 & Saturday, Februrary 2, 2019. All participants of Assembly Winter 2019 with computer ticket can participate in the tournament. Qualifiers consists from 2 groups and each group has 16 teams. After qualifiers top 8 teams from each group will proceed to the final. Participants are required to have their own computer. Create a team and list all the members of the team and their computer seats in the description. Click the signup button on this page (located on the right side bar). Check-in at the venue on Friday, February 1, 18:00--21:00 EET. 1.1 The tournament organizer and judges have the right to change the rules so that special situations can be resolved to ensure a fair game. 1.2 Make sure you have the latest version of PlayerUnknown's Battlegrounds. 1.3 Respect tournament organizers, players, and viewers, and avoid any kind of unsportsmanship during the event. The tournament organizer and the judges have the right to remove the player / players from the tournament if they are disrupted. 1.4 All programs that are not part of the original game, including game file editing, are prohibited during the tournament. Audio programs such as teamspeak, discord etc. are allowed during the tournament. 1.5 All the tournament matches must be played from your own computer place, from your own computer! Assembly Winter 2019 own rules will also apply during the tournament. Read Assembly general BYOC rules below! 2.1 Players, team names and logos must remain within the limits of good taste. No sexuality, racism, terrorism or any other offensive affair may occur in the name. Tournament judges can be contacted if you think that your own username or team name is suspicious and you want to be sure that you can use it in the tournament. 2.2 Protest can only be done when all games in your own qualifier group are played/after the finals. The protest can only be made by the team captain directly to the tournament head admin or judges. All protests must be made within 10 minutes of the end of the last game. Pauses are not used during the game to make protests. The cases are handled by the admins after the match. *For example, a false protest is a suspicion that an error has occurred in the calculation of the results. After that, the judge checks the counts with the protester and if the results are correct, this is a false protest and the team is reduced by -50 points. 2.3 Participating in the tournament required a team of at least four players. Less than four players will not be allowed to participate or play in the tournament. If one or more players become sick before the tournament, immediately contact the organizers of the tournament and look for potential substitutes! 3.1 Game mode: Squad FPP. 3.2 In qualifiers each group plays two Erangel maps and one Miramar map. Please note that the order of the maps is random in every group! 3.4 Circle Settings: Modified (see the picture below). If two teams end up in same points situation, the number of kills is determined. 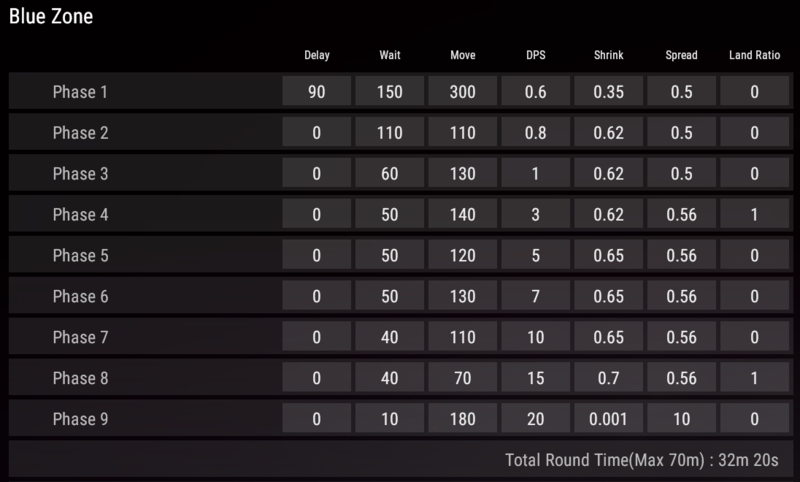 If the kills are same, consider who has been better placed in earlier games. 3.6 Sharing the password of a game lobby to others is prohibited! If you share the password with outsiders, it will result in the rejection of the entire team from the tournament. Write the lobby password in the memory, the qualifying games have the same password and in the finals your own, which is announced to the captain of the teams in the finals. 3.7 There is a 10-minute break between all games. Joining in the new lobby is included in the break. If the whole team / part of the team is missing after break and they have not informed the judges of the matter, the game begins without them. REASON: The team plays a person who does not have a ticket Assembly but is played online. Participating players have the right to propose additional rules or to change a rule if they feel it is unfair or has a good change proposal. Changes can be made to the Head admin at Discord. These rules apply for all the BYOC-tournaments in Assembly Winter 2019. For team games a minimum of 2 players from the team must be present during the check-in. Administration of the tournament has the last word in any and all disputes and can make decisions outside the specified rules if deemed necessary.